Protesters slam Jerusalem gay parade, call for organizers to 'show respect' for city's residents. Dozens of right-wing demonstrators associated with the Lehava anti-assimilation organization gathered in the capital Thursday to protest the Jerusalem gay parade now underway. The demonstration was led Lehava chief Bentzi Gopstein, attorney Itamar Ben-Gvir, and Hevron activist and 2015 Yahad candidate Baruch Marzel. Gopstein claimed the parade offended residents, and said the marchers would not have held such an event in an Arab community. 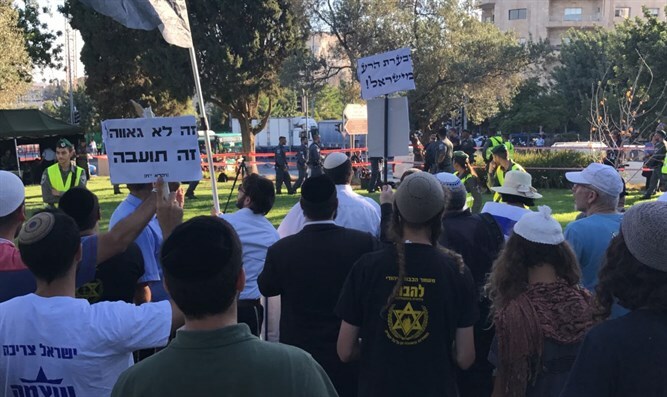 While only several dozen protesters were allowed to join the Lehava demonstration, Marzel claimed he and fellow demonstrators represented the majority opinion in Jerusalem. “We came here to protest against these people who are desecrating Jerusalem and the Holy Land. These marchers are endangering all the Jews in Israel,” said Marzel. Despite his rhetoric, Marzel insisted that he opposed the march but had no personal animus against the participants. Thousands of marchers took part in the Jerusalem gay parade Thursday, which was secured by a large contingent of police officers and Border Police officers. Participants in the march were required to undergo security checks before being allowed into the parade’s security perimeter. In 2005 and again in 2015, the Jerusalem gay parade was attacked by Yishai Schlissel, a resident of the haredi town of Modiin Illit. In both occasions, Schlissel stabbed marchers before being neutralized by police and arrested. During the 2005 march, Schlissel wounded three parade participants. Three weeks after he was released in 2015, Schlissel attacked that year’s Jerusalem gay parade, killing one and wounding five more. He is now serving a life sentence.